Our mission is to provide graduates with the competence and confidence that will sustain a career in healthcare. ECR of GA provides graduates with appropriate knowledge and skills to meet the needs of today's patients and employers. The program is an introduction to the field of nursing. For 4 weeks students will acquire and demonstrate a variety of nursing skills such as vital signs, communication and assisting patients with activities of daily living. ​A 3 month course that provides technical skills necessary to perform personal care to complex patients such as wound care, catherization, trache care, venipuncture, telemetry , and implement selected portions of care plan including respiratory and rehabilitation services. Graduates of this program can expect to find employment in hospitals or other health care facilities, clinics and group practices. A 6 month course that equips students with the necessary skills in a variety of medical office & laboratory procedures. These include EKG, vital signs, urinalysis billing, point of care, phlebotomy, assisting in minor surgery and other emergency situations. Also, students will learn front office skills such as accounting, patient data collection, insurance claims processing and billing. A 6-week course that teaches blood collection techniques, prepares you for emergencies and how to understand proper laboratory procedures in order to avoid contamination or infection of yourself & others. Duties of the Phlebotomy/EKG Technician include but are not limited to collection of specimen, infection control and assisting cardiologist with the evaluations of the heart. Graduates can expect employment in hospitals, physician's offices or imaging centers. A two-day course that teaches the guidelines regarding the distribution of medications to residents in Assisted Living, personal care homes and other intermediate care facilities. This informative course enhances the skill level of the Georgia Certified Nursing Aide. 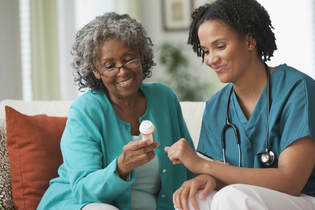 The Medication Aide is trained and authorized by the Georgia Medical Care Foundation to distribute medication to residents in Assisted Living Facilities, Personal Care Homes and other non-hospital environments. A one day American Heart Association Certified CPR and First Aid interactive course designed for healthcare providers, child care providers or the lay rescuer. This course teaches skills of CPR for all victims including ventilation with a barrier device, use of AED and the relief of FBAO in responsive and non responsive victims. The course presents information about AHA Chain of Survival, signs of a heart attack, stroke, choking and other health emergencies.